Dr. Matt Houngnikpo is an adjunct professor of practice at the Africa Center for Strategic Studies, as well as the strategic planning advisor to the Strategic Governance Initiative in Mali. His work focuses on democratic security sector governance and reform, the design and development of national security strategies, and democratic governance. 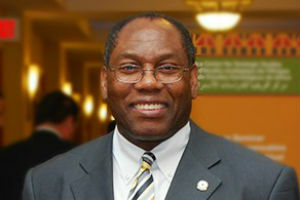 Until July 2013, Dr. Houngnikpo was the academic chair of civil-military relations at the Africa Center, overseeing curriculum and program development in the area of civil-military relations, focusing on Africa’s military history, democratic civil control of the security sector, and issues of accountability, transparency, and good governance. Dr. Houngnikpo also assisted the government of Côte d’Ivoire in implementing security sector reforms, and he has held various teaching positions in both the United States and Benin. Dr. Houngnikpo holds a Ph.D. in political science from the University of Paris VIII in Saint-Denis, France, and a Ph.D. in international studies from the University of Denver. “Repressing or Protecting? The Security Sector and Society in Africa,” in The Fabric of Peace in Africa: Looking beyond the State, Pamela Aall and Chester A. Crocker, eds. “Post-face: du lien entre Etat, armée er société,” in Les Armées africaines et le pouvoir politique au sud du Sahara, Axel Augé and Amandine Gnanguênon, eds. “Eroding Democracy: Competitive Authoritarian Drift in Benin,” in Democratic Contestation on the Margins: Regimes in Small African Countries, Claire Metelits and Stephani Matti, eds. “AFRICOM: African Concerns and Criticism,” in African Security and the Africa Command: Viewpoints on the US Role in Africa, Terry Buss, Joseph Adjaye, Donald Goldstein, and Louis Picard, eds. “Small Arms and Big Trouble in Africa,” in African Security and the Africa Command: Viewpoints on the US Role in Africa, Terry Buss, Joseph Adjaye, Donald Goldstein, and Louis Picard, eds. West Africa Review, Issue 10, 2007.